Landowners Bill J. Brown, Reagan Brown, Alyssa Ann Brown McCoy, Marie F. Meaney, and Bart Braselton submitted a petition to the City requesting the annexation of their land, containing 161.56 acres located south of the Oso Creek, north of TxDOT’s Farm to Market 43 (Weber Road) and along the west side of County Road 33, and which is the location of the proposed London Towne Subdivision. The proposed London Towne Subdivision includes approximately 660 single-family dwellings. The developer has already submitted a final plat for the first development phase, London Towne Subdivision Unit 1, consisting of a 23.02-acre tract with 94 single-family dwellings and a 1.9-acre park. A Wastewater Trunk Main Line Extension Construction and Reimbursement Agreement was approved by City Council on May 8, 2018, to extend municipal wastewater service to this area. Construction of the lift station and related service lines is currently underway. The proposed annexation area includes up to 1,500 acres of land generally located along the north side of Corpus Christi Bay within San Patricio County. This annexation includes parcels of land located between the Cities of Portland and Gregory from US Highway 181 to Farm-to-Market 2986; and parcels of land located south of State Highway 35, east of US Highway 181, and west of La Quinta Road. The annexation area includes Port of Corpus Christi property that will connect to the future location of the estimated $7.5 billion ExxonMobil/SABIC plastics manufacturing facility. The proposed annexation area includes up to 5,700 acres of land generally located along the north side of Corpus Christi Bay within San Patricio County between the Cities of Gregory and Ingleside. This annexation includes parcels of land located between State Highway 35 and Corpus Christi Bay; and between La Quinta Road and County Road 93 and the western bounds of the City of Ingleside’s extraterritorial jurisdiction. The annexation area includes property owned by TPCO America Corporation, Chemours Company, Occidental Chemical Corporation, Cheniere Land Holdings LLC, and other privately owned parcels. 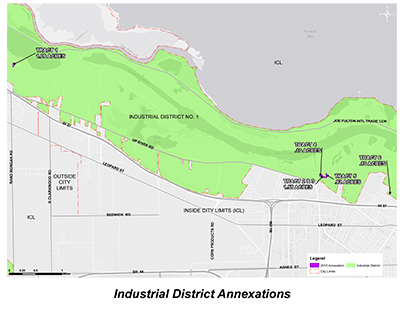 This annexation action will allow the City to provide for orderly maintenance of existing industrial use and the future expansion of those uses in the local area. 5-15-2015 - Petition with property legal description is received from Sam Kane Beef Processors. 5-26-2015 - 1st Reading of an ordinance annexing approximately 70 acres of land generally located on the southwest corner of Leopard Street and N. Clarkwood Road and known as Sam Kane Beef Processors. 5-28-2015 - Petition with corrected property legal description and new company name is received from SKB Acquisition LLC. 6-9-2015 - 2nd Reading of an ordinance annexing SKB Acquisition LLC (formerly Sam Kane Beef Processors). 6-10-2015 - Internal City notification to service providers. 6-1-2015 - Notification to the Nueces County Clerk’s Office and the Nueces County Voter Registrar. 3-25-2014 - Council passed resolution opposing wind farm. 4-15-2014 - Motion directing the City Manager to begin the process of annexing the area of the extraterritorial jurisdiction (ETJ) where the proposed Chapman Ranch wind farm is located. 6-10-2014 - Motion directing the City Manager and staff to continue with annexation proceedings. 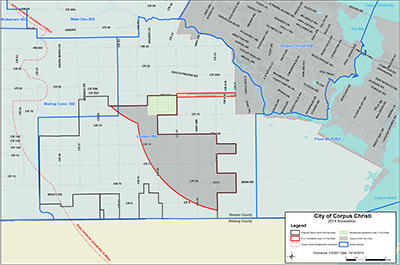 7-15-2014 - Council approved resolution to begin annexation of 16.34 square miles of land into the territorial limits of the City of Corpus Christi. 8-19-2014 - First public hearing on Southside FM 2444 Annexation. 8-26-2014 - Second public hearing on Southside FM 2444 Annexation. 9-16-2014 - First reading of annexation ordinance was approved. 10-14-2014 - Second reading of the annexation ordinance was approved. 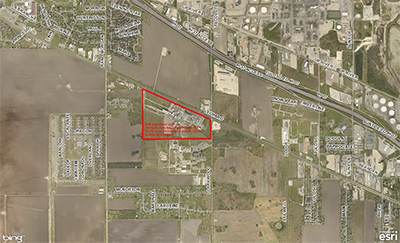 The new extraterritorial jurisdiction of the City of Corpus Christi extends five miles from the newly annexed property. On October 14, 2014, Council Adopted a resolution directing staff to use property tax revenue from the annexed property in the Chapman Ranch area to first fund costs of utility construction and improvements in that area in order to avoid increases in utility rates for such improvements. Staff was also directed to create a special revenue fund to accumulate amounts equivalent to the property taxes received from the Southside FM 2444 Property for these infrastructure improvements. It is anticipated the property tax revenue received by the City will be used to pay the debt that would be used to finance the construction of the infrastructure improvements. Any remaining funds after the construction of the required infrastructure improvements can be transferred to the General Fund and used for general government operations.